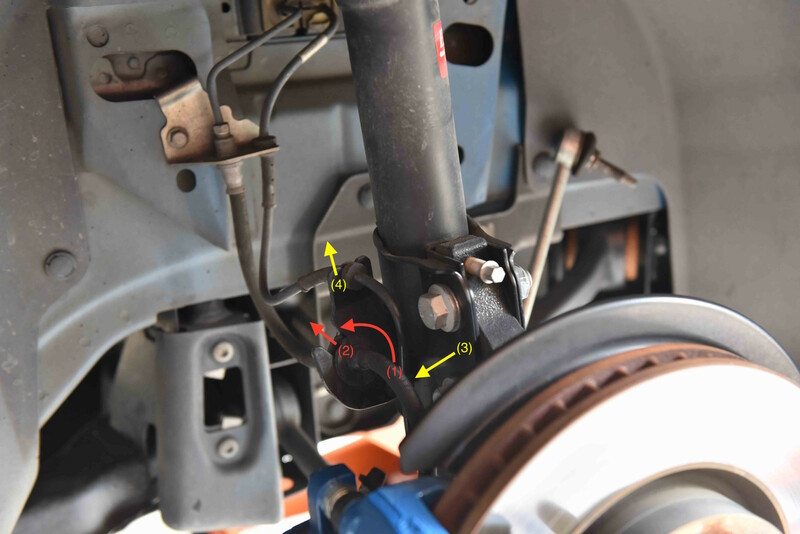 This AutoInstruct guide will show you how to remove the front strut assembly on a VE or VF Commodore. This process is relatively easy, with only basic tools required. 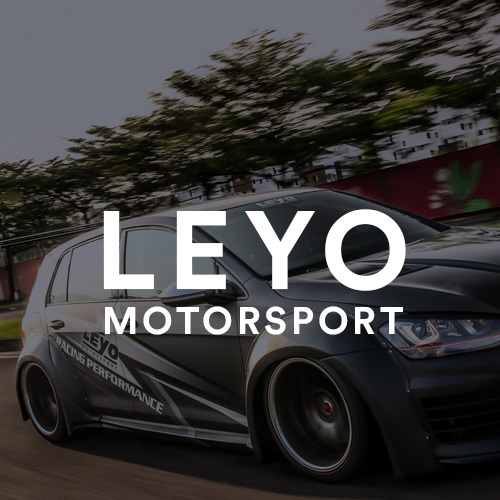 Raise the front of the car and remove the front wheels. Note: Never place your body under an unsupported vehicle! Always use jack stands! Grasp the centre shaft using a spanner. 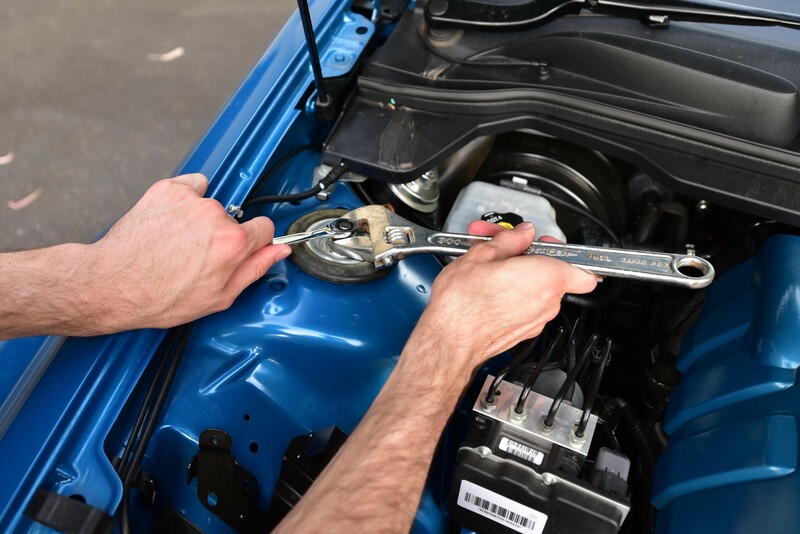 Whilst holding the centre, use another spanner turn the nut anti-clockwise to loosen. Only loosen this nut a few turns, do not remove it entirely! Next, unbolt the swaybar end link. Hold the centre using a socket whilst undoing the nut with a spanner. 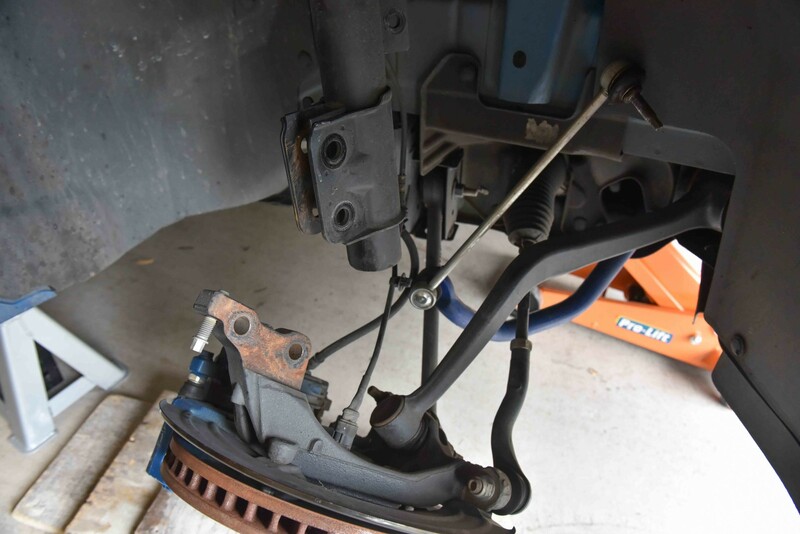 In this stage we will remove the brake line and wheel speed sensor cable from the strut bracket. 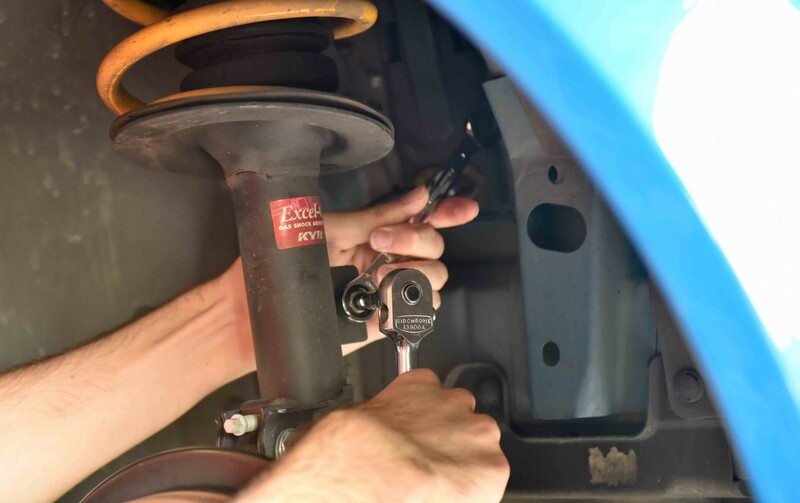 Loosen and remove the two large bolts located on the bottom of the strut. 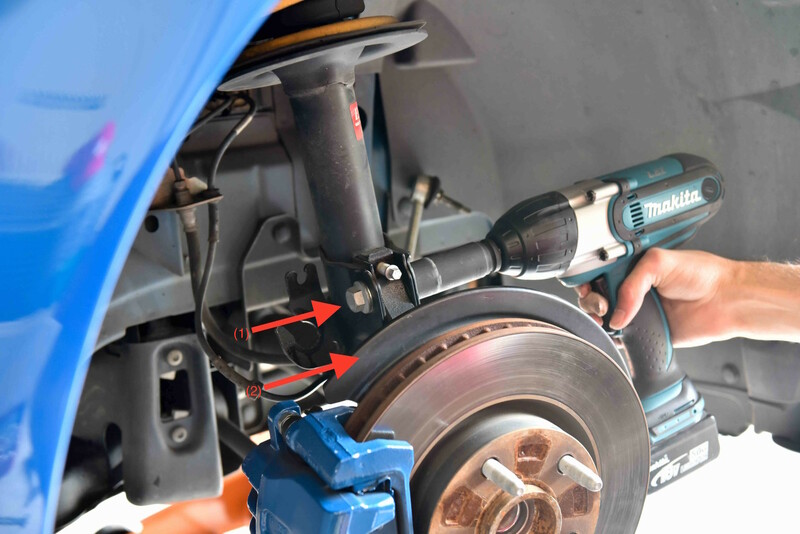 You may need a breaker bar or impact wrench as these are very tight. Note: As these are stretch bolts they should be discarded. New nuts and bolts should be used. 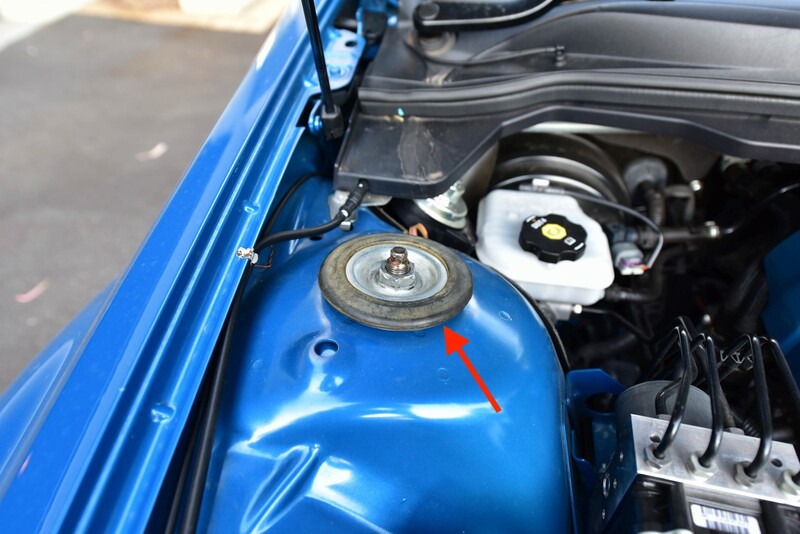 Once the two bolts have been removed, gently lower the hub onto a box or bucket to support it. The strut is now being held in place by the shaft nut in the engine bay. You will need to support the strut as you undo the nut and remove the strut hat. This is carried out in the next step. 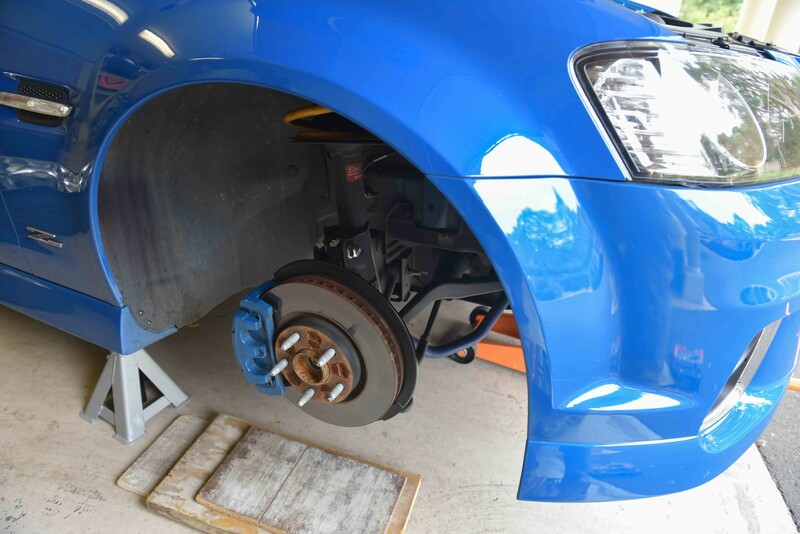 Whilst supporting the strut from within the wheel arch, undo the strut nut and remove the strut hat. 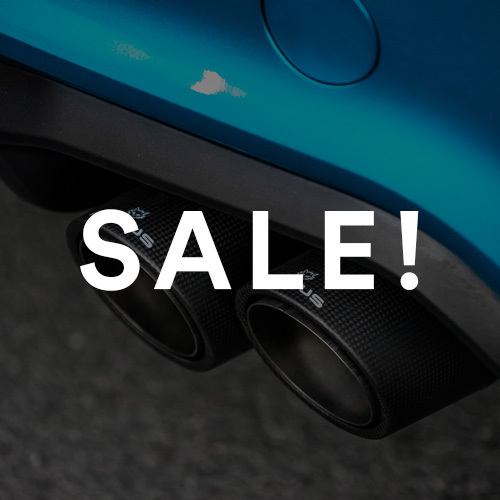 The strut will now be free from the vehicle. Nice Work! The strut removal is now complete. 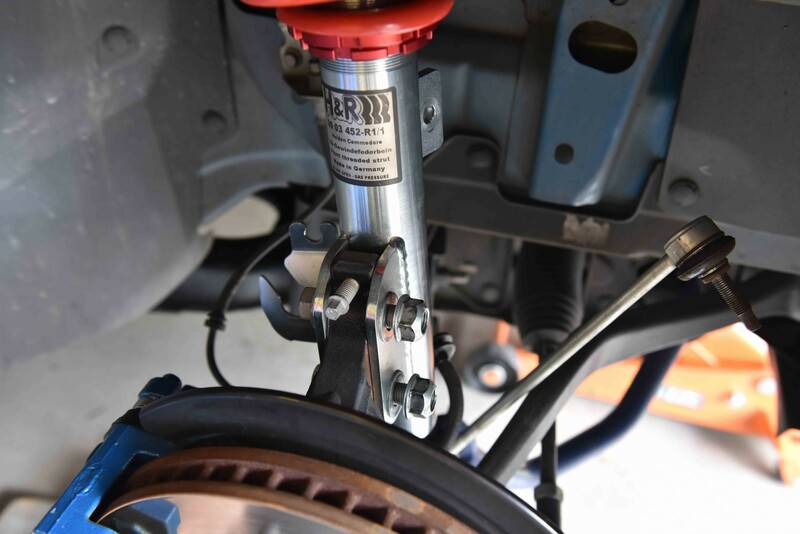 Are you looking to disassemble the strut to install new springs, shocks or perhaps both? 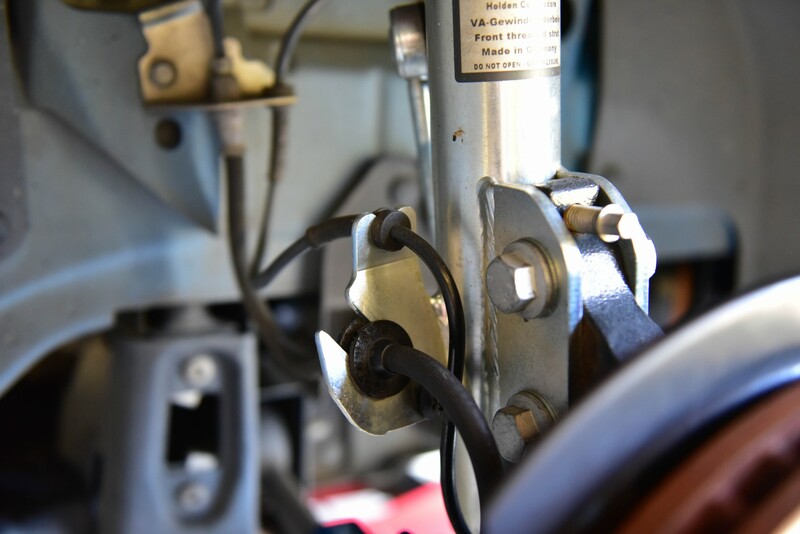 See our guide on Front Strut Disassembly! Guide the strut back into the wheel arch. Position the top of the strut so it protrudes into the engine bay. Place the strut hat onto the shaft and screw down the nut by hand. We will tighten the nut to specification as our final step. 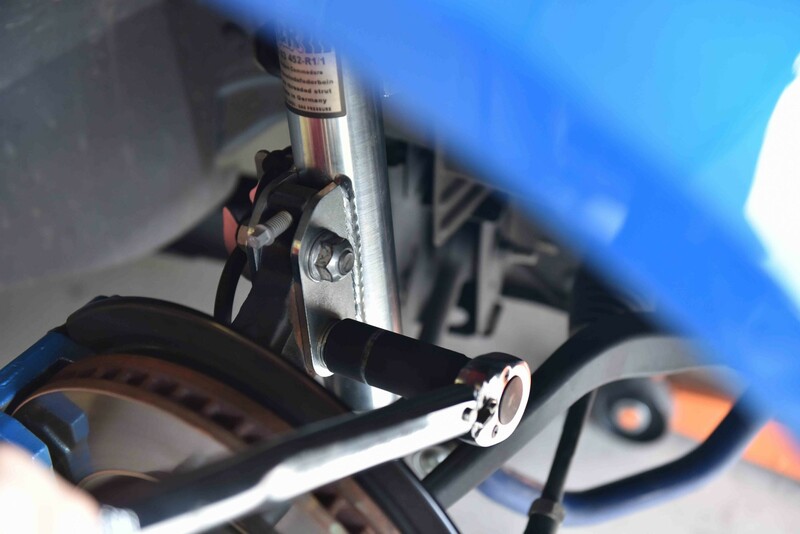 Using new nuts and bolts, insert the two strut-to-hub bolts, washers and nuts. 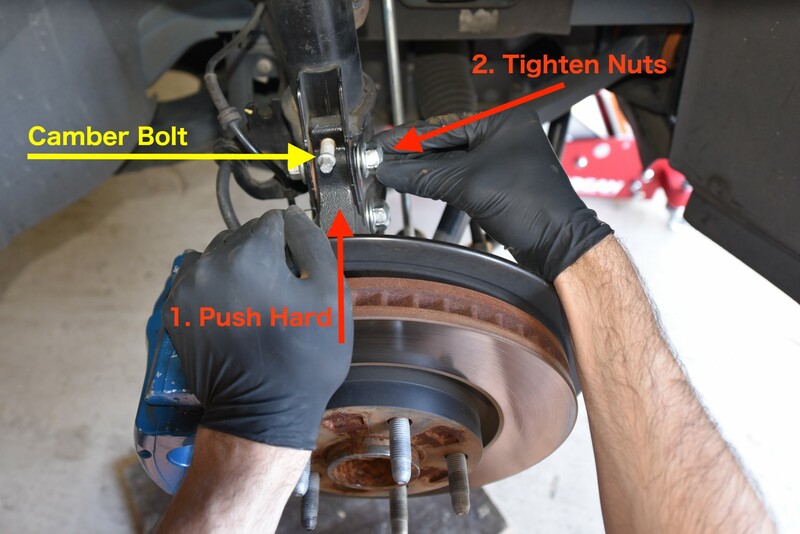 Push the hub hard against the strut and tighten the nuts whilst in this position. 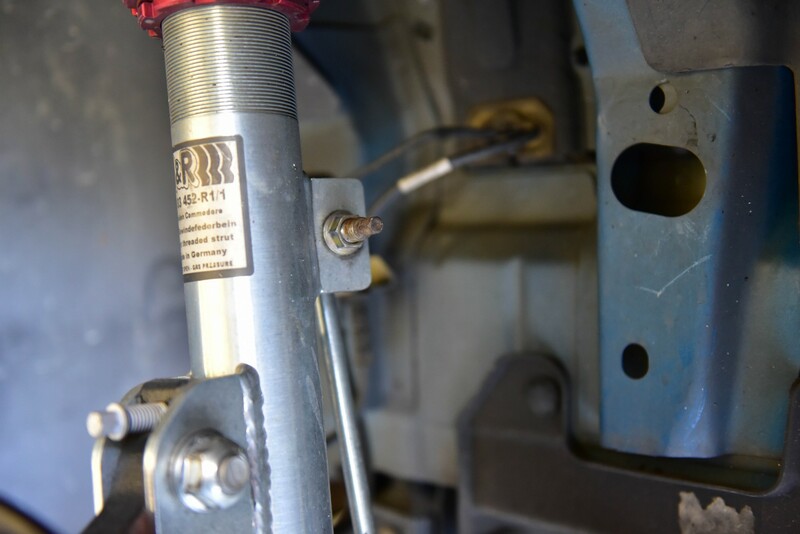 This aligns the camber bolt onto the strut as per the picture. Tighten both strut-to-hub bolts to 100nm Each. Then turn each nut an additional 90 degrees. These are stretch bolts and should be single use only! Attach and tighten the sway bar end link. Torque to 50nm. Re-attach the brake line and wheel speed cable to the bracket. 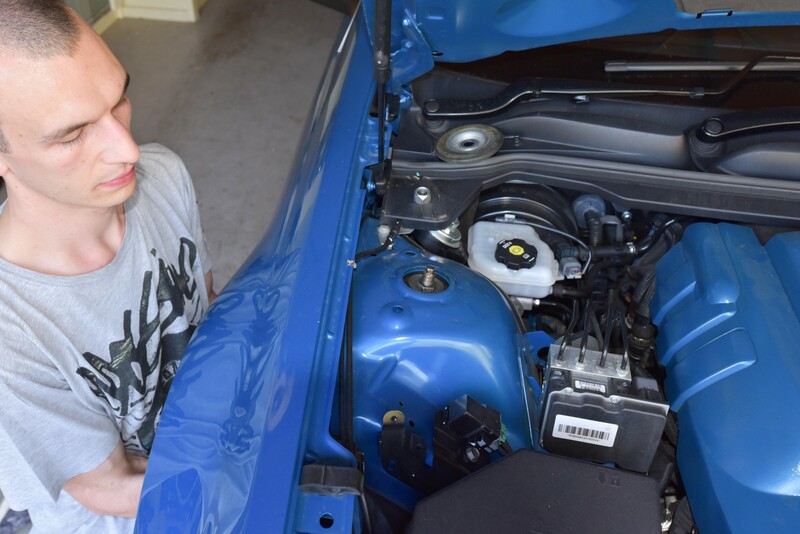 The final step is to tighten the upper nut within the engine bay. Torque to 55nm.